I was blindfolded, led into a room, and seated at a table. My “guide” gently took my hand and slowly mapped out what lay before me: 4 wine glasses, a water glass, and a cheese plate. 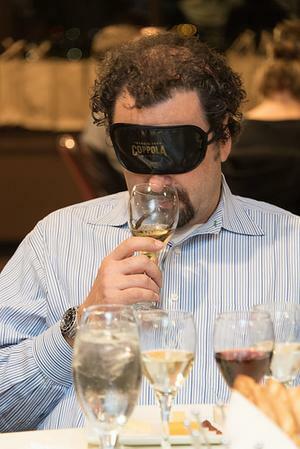 I was there to explore how the aromas and flavors of wine are accentuated by depriving an important sense when tasting: our eyesight. The “Tasting in the Dark” wine event was hosted by Francis Ford Coppola Winery and Hoby Wedler who was about to lead our small group to a new world in sensory appreciation. Hoby, close to earning his doctorate in computational organic chemistry from UC Davis in California, is a rising star in the wine world (some referring to him as a savant when it comes to taste and scent), and was enlisted back in 2011 by Coppola president and director of winemaking Corey Beck to help launch the ‘Tasting in the Dark” series. We were seated in a private room atop Seattle’s beautiful 360-degree-view Space Needle, an ironic location considering we were all blindfolded. Our host Hoby entered the room and welcomed us, the dulcet tones of his voice further igniting my excitement for the evening (most of us already giddy over being blindfolded). We were then led through a series of exercises to help us focus and fine-tune our sense of smell. “Close your eyes. Now breathe in deeply through your nose, then out your mouth,” he instructed us. We repeated this a few more times then were, one by one, handed a glass and asked to describe its contents, which was floating in a base alcohol. 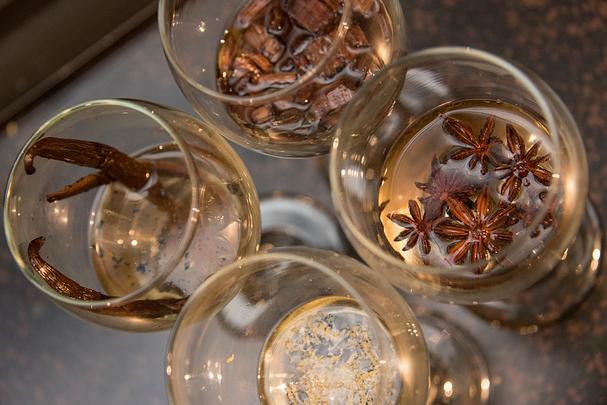 Lemons, orange, citrus, licorice root, star anise and vanilla bean were some of the aromas called out. But what was that last one? Most of us were stumped. Only the sommelier in the audience guessed it: oak shavings. When have you had the opportunity to smell the fresh oak of a new wine barrel before it imparts its flavor into a wine? It's a smell I'll certainly add to my memory bank. With our sense of smell heightened and our palates begging we embarked on the exciting task of tasting the wines, not knowing the color or arrangement of the flight before us. Think of how knowing the color of a wine before you taste it can affect the way you would describe it. Could you distinguish between a red and a white? Here, we were relying solely on our nose and palate. Hoby keenly guided us with each inhale, each sip, and encouraged us to shout out what we smelled and tasted. He was getting us to look at wine in a new and exciting way - even a visual way. The more I smelled and tasted, the more I “saw.” Stone fruit, ripe black cherries, a bit of tobacco, some leather, chocolate…I knew it was a red. With each wine we tasted an appropriately paired cheese, which sparked another wave of exciting descriptions for the wines. “Oh, wow, now I taste cassis!” I heard someone shout out. We were all having a ball. 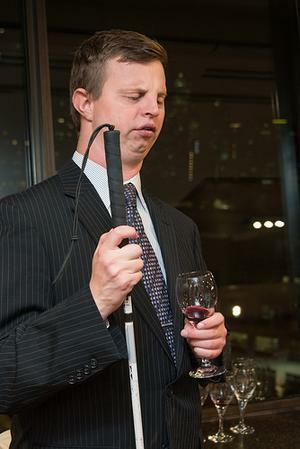 After the tasting Hoby asked us to remove our blindfolds so that he could formally introduce himself. There was a collective gasp among us. What we did not know beforehand was that Hoby is blind. He spoke so visually one would never have guessed. Born with a rare disorder known as Microphthalmia, Hoby grew up to be a passionate explorer of taste and smell, his parents encouraging him to taste things and describe what it was. Little did they know those lessons, meant to teach him how to navigate his environment, would lead to a career in wine and science. He graduated from UC Davis in 2011 with a double major in history and chemistry and, thinking his blindness would pose too great an obstacle for a sight-oriented science, planned to continue his advanced studies in history. But after the mentoring of a chemistry professor at Davis, he continued his science studies, the lab becoming accessible to him through three-dimensional models. Beck says he describes wine better than most winemakers he knows. What I know is that Hoby taught me things about wine - tasting, smelling, and yes, seeing - I never thought possible. Image how many other beautiful things we could see if we closed our eyes. 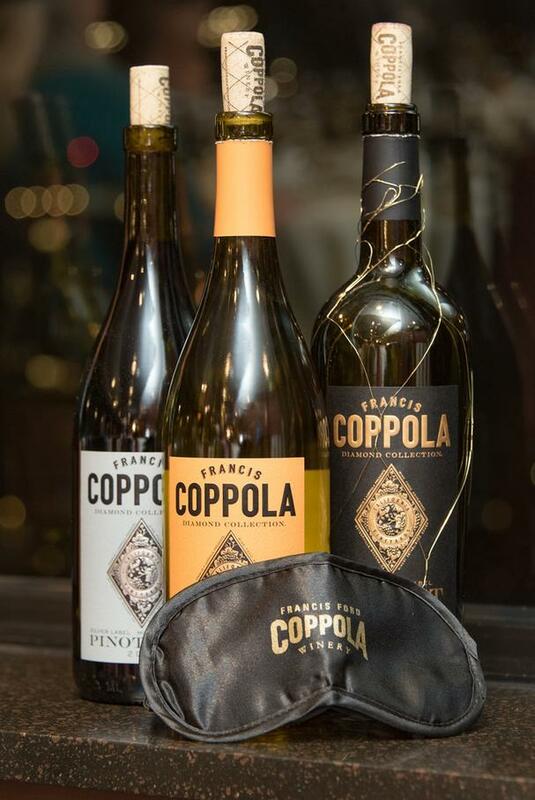 *For more information on “Tasting in the Dark” visit Francis Ford Coppola Winery. 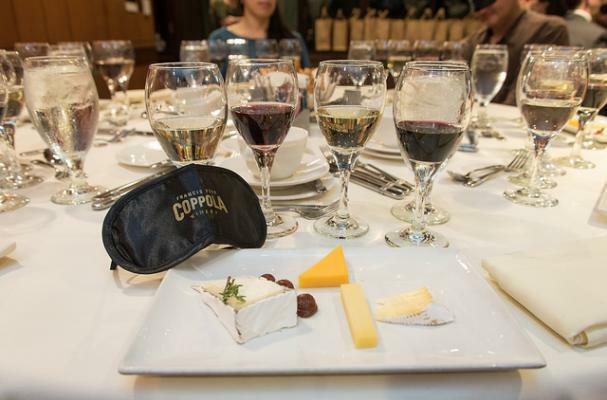 The wines tasted that evening were from the Coppola Diamond Collection. If you are unable to attend a Tasting in the Dark event at the winery, I recommend the following bottles to host your own blind tasting at home with the following cheese pairings. A fun wine tasting activity for any party!